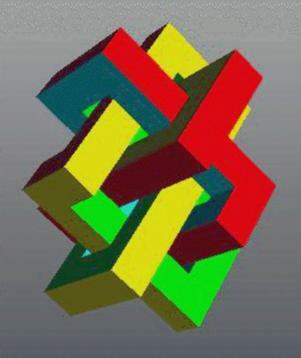 A square rod with only 90-degree bends in the topology of a Chinese Button Knot. This is version # 1 of a tight packing of the Chinese Button Knot given the constraint of a rectilinear, axis-aligned path. The piecewise linear path was generated by hand, and the prismatic shape around it was generated by the program "ugworm." The orientation, scale or strength of this model is not critical; it can be scaled so as to fit optimally a particular process or some remaining space in a run of a larger piece. The .STL description currently spans a cube of about 12x12x12 units. An STL description of the part can be found here.